Please accept my blessings. I beg to acknowledge receipt of your letter dated 7th September, 1971 and have noted the contents carefully. So far taking collections of Rs. 25,000/ each from 100 men if you can make this program successful, then you will fulfill the desire of Krishna very brilliantly. We must have a nice center at Mayapur because we are expecting there students from all over the world. Plans of the temple have already been made and you should have received them by now. The buildings should be exactly in the same pattern. The size may be changed according to the engineering technology. I have shown in London the Westminster Abbey to Syamasundara., Bhavananda and Nara Narayana. Perhaps you have also seen it. I want the inside just like the Westminster Abbey. You will understand from the plans what is my desire in this connection. Our policy should be for maintenance to take from many persons. Big donations should go to the building and book funds. Our policy is madhukari or the profession of the bumblebee. The bumblebee does not eat all the honey in one flower. It goes from flower to flower and takes little. The purpose is that saintly persons, Vaisnavas, if they take something from many men, everyone is benefited. We should not follow the policy that one man gives us everything and we become idle. This is a material policy. Whatever Mr. Jayan is contributing should go directly to the building fund and for maintenance we should collect from many persons as monthly subscription and big donations should go to the book and building funds. And so far your idea for giving the bank instructions to deposit 50% in each account, the bank will not take so much trouble. Better you do it. Already there is book and building fund accounts. As soon as the money is there, you should deposit 50% in each. So far your travelling expenses, if you spent Rs 13,000/ in four months that means over 3000 Rs in a month or more than Rs 100/ in a day; that is certainly extravagancy. That means if you have collected one member in a day then 10% is immediately spent for taxi fare. That is not a very good proposal. When the accounts will be audited, the auditors will want debit vouchers for each payment. Whether all expenditures have been made under such vouchers. Otherwise the auditor will not pass the account. So far the debt of Rs 23,000 if you adjust it in that way then the same problem remains. The fact is that we require at least 25 lakhs for Mayapur. Before beginning our construction work there we must be confident that the amount will be easily collected. Better to realize the Rs 23,000/ by another source. The fact is not that how it should be realized but some plan how this extravagancy may be stopped. That is the real problem. Hence forward all expenditure, proper debit voucher must be maintained. If we do not place audited accounts to the Registrar of Societies they may cancel us. That is the law. Please accept my blessings and offer the same to your good wife Yamuna. I am in due receipt of your letters dated 30th August and 6th September, 1971, respectively and have noted the contents carefully. Also enclosed was a copy of the letter to Hans Roy Gupta from K. C. Pant. Thank you for securing this nice letter. You should send a copy of this letter to all our centers in India so that if there is any harassment of the security police, we can utilize it. I think that in Bombay since they have received this letter, our devotees are not complaining about police harassment. Also it is understood that Bhatliwalla that most disturbing element, is now a days also silent. So all this is a great help done by Hans Roy Gupta. He is a very nice man. So keep good relationship with him. He can be a great help in the future also provided he keeps a good impression of our society. If he keeps a good impression he will be able to help in all respects. Yes, when you will give me a complete list of the chief guests and on what dates they will come, then I shall give you the subject matter on which I will speak. I shall make the subject matter according to the guests. Perhaps you remember in London when I spoke in Conway hall. Similarly I shall give you a list. Yes, take the recommendation of the Mayor, J. Dalmia and others. That will be a very great help. Make a copy of the letter to show to individuals that our service is approved by the government and the mayor also. That will be most beneficial. President Giri must be chief guest (preside) one day at least. If Giri can attend one day then why not Indira Gandhi? If Indira Gandhi says that she cannot attend such a function then how the president will attend? Is there any difference between the president and the prime minister? There is no need to invite Dr. Radhakrishnan. He is a retired man. So your selection is already nice. We want all influential men to sympathize with our movement. That is our aim, because if these big men are sympathetic then all the common people will follow. Please accept my blessings. I beg to acknowledge receipt of your letter dated 2nd September, 1971 and have noted the contents carefully. Regarding Dr. Bali's letter, I have already replied it and sent you one copy of the reply which you should have received by now. The program you are arranging for Madras sounds very nice so do it combinedly. Regarding the government injunction, that is the worst situation of this age. The so called democratic government means some of the sudras, rascals without any knowledge of the highest aim of life. By hook and crook they get some votes and get the responsible chair in government. Naturally they can whimsically enact any law which is against the interest of the people in general. According to the Vedic literature, the government's first duty is to see whether people are following the rules and regulations of varnasrama dharma. That is explained in Bhagavad-gita also. Without coming to the system of Varnasrama dharma there is no question of human society. So our Krishna Conscious movement is supposed to be representative of Krishna. Krishna, when He appears on this earth, He has two fold business to execute. One business is to give protection to the devotees for advancing in Krishna Consciousness and the other side is to kill the demons. Although we are representing Krishna, we are very much poor in strength. Our only strength is chanting Hare Krishna Maha-mantra. So if we stick to the principle of chanting Hare Krishna Mantra, following the rules and regulations, that will give us strength to work on both sides--namely to enlighten people in Krishna Consciousness and cut down the bad government full of atheistic people. Our only hope is to chant Hare Krishna and rectify the whole situation. I think this is possible. It has been proved in Calcutta that the Naxalites were very much against us holding our Hare Krishna Festival, but still later on they became sympathetic and did not cause any harm for us. If we follow the same principles everywhere, I think the bad government all over the world will come forward sympathetically for advancing this movement. Eating is the basic principle for keeping one's health. Eating too much or too little causes disease. 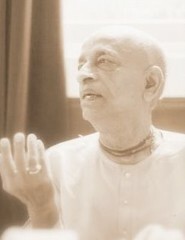 Therefore Bhagavad-gita says yuktahara vihara. Simply eat to keep fit. That is one important business of those in Krishna consciousness. Generally hepatitis is a disease on account of eating too much fatty and spicy foods. So we must use always simple food stuff and a little milk. Not very much puris and halava and sweet balls and sweet rice, like that. Yes, this program is very nice to try to attract the attention of the students seriously. That will be a great success. They should put intelligent questions and they should be answered properly with reference to modern science and philosophy. That will be very much convincing. I think if you read our books thoroughly you will get a supply of material to answer all the questions. Now I am preparing one book answering all types of philosophical arguments. Syamasundara. every morning is putting questions from different angles of vision beginning from Socrates, Plato, Aristotle, etc. and we are trying to answer. We shall discuss also Marx philosophy of communism. It will require some time but I wish that all our preachers should be well versed with all philosophical ideas and after studying all philosophical points of view we will put Krishna Conscious philosophy on the top. You should see Mr. Dvnva, R.D. Birla promised four sets of Deities. What happened to them? We require pairs in Mombassa and Nairobi also as well as Paris, Berlin, Birmingham, etc. P.S. Brahmananda has ordered 50 sets of books. Why they have not been sent? Immediately you should send the 50 sets of books and invoice and according to that invoice you will be paid without hesitation. Please accept my blessings. You will be interested to know that this evening I will be going to Kenya, East Africa. The Mombassa address is given above. Some program has been fixed up there, and I have consented to go there for some time. By now I had expected some letter from you. I am anxious to know how things are going on there. So please let me know at the above-given address. Any letters you have already sent to London address will be forwarded there directly.